I am long overdue a posting here, so much has happened in the past couple weeks I haven't had time to fully process any of it. During this last weekend of uncharacteristic freedom The D and I went for a drive on the rural roads of Palymra, PA, and stumbled upon the remains of a story written on a house. We whizzed past the above building- part of a cluster of at least four: a main house, a large shed, a garage and a tree house. 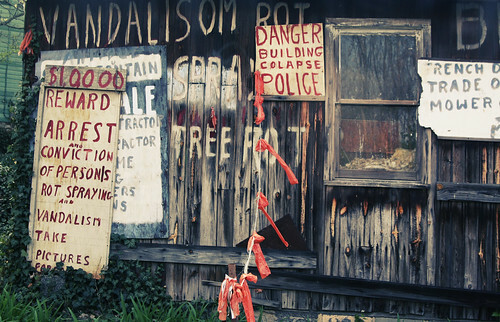 All of these were covered with signs with handpainted words: VANDALISM ARSON ROBBERY MAIL FRAUD ROT SPRAYING POISON TREE ROT BUILDING COLLAPSE NO TRESPASSING TAKE PICTURES. 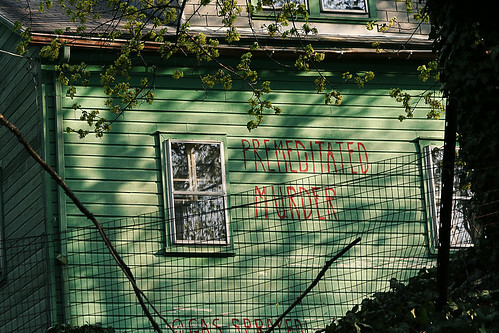 Dates, the names of people and police officers, threats, accusations, money rewards, history, purported events, offers, items for sale, and in large red letters on the back side of the green house PREMEDITATED MURDER next to GAS SPRAY. "Violet Hobaugh (who is now 90 years old) was a welder with, I believe, the Bethlehem Steel company. She gained her "fame" by taking on PennDot (that's the Pennsylvania Department of Transportation) because they wanted to remove a certain tree in order to expand and improve a very dangerous curve in Gravel Hill road. While technically on her property, the tree was officially well within the State's Right of Way. She fought it because, she maintained, the tree protected her house from cars that veered off the road. She built a tree house in it and lived there for over a year. They couldn't cut it while someone was living in it, and they couldn't forcibly remove her from it. Her story was picked up and broadcast nationwide. Poor old lady in the tree. The tree and the tree house are still there although she lives in her house. She has had no heat for the past 18 years and spends the winter bundled up with old newspaper bags over her shoes. She is a local hermit (ess?) who is off her meds. Probably schizophrenic, from the articles about her. The man named Sam Hoover [who she wrote notes to on the house in various spots] and his family used to try to take care of her, bringing her plates of food and helping her shovel snow or rake leaves. Her mental illness got worse and worse until she began making accusations against the people who were trying to care for her. She calls Sam The Windman because she thinks he releases some kind of chemicals or germs into the wind and it is poisoning her. I hope you used a telephoto, Lady Neue. I hear she's packin'." We pulled into the driveway on Gravel Hill Road, just off Route 22 (as it is actually a very dangerous spot on the road), not knowing any of the story, and took some photos of the nearest buildings, the shed and the garage. I made a set of the photos here. Fascinating story, remarkable photo set. How do you find this stuff? We actually set out to spend the afternoon in Hershey, but that was a gross mistake. Completely devoid of evidence of human life. Good slice of pizza though. We just kept driving and took a random turn... get yourself lost. Not great advice when gas is around $3/gal... but what can I say, we are zany that way. My half-sisters (3 of them) mother was exactly like this. Such a sad story. Violet Hobaugh passed away this week. I know Violet's son Jack. He was my late sister's last boyfriend. I am in regular contact with him and he has told me quite a bit about his mother. He tried hard to maintain his relationship with her. It's amazing what she was able to do and how she managed to live, despite her mental illness. Anyway, good work! Take more pictures. It might be worth your while to document what happens with her property now that she is gone. Thank you so much for leaving a note. I actually think of her quite often, years later. I am very sorry to hear she has passed. I absolutely hope to make it out that way in the coming months to see what becomes of the property.